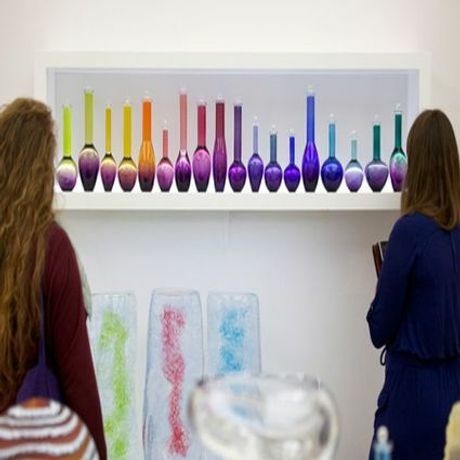 Collect, the leading international art fair for contemporary objects, returns to the Saatchi Gallery in 2014 with an impressive roster of 36 international galleries. This showcase of innovation and excellence will feature contemporary objects for sale from over 400 artists, ranging from ceramics and glassware to jewellery and woodwork, cementing Collect 2014 as the place to view and Collect museum-quality contemporary craft. The fair appeals to established and new Collectors alike and acts as a perfect springboard to start cross-Collecting. Collect was launched by the Crafts Council in London in 2004 and has since established itself as the leading international art fair for museum-quality contemporary craft, attracting both private and institutional Collectors  the VandA, the British Museum, the National Museum of Scotland, the Mint Museum, USA, and the National Museum of Decorative Arts, Norway, to name a few - looking to buy exemplary work from leading artists from around the world. Prices start at £500, rising into the thousands. In 2014, the Crafts Council welcomes back galleries from all over the world, including Yufuku Gallery from Japan, the Korean Craft and Design Foundation, blasandknada from Sweden, Galerie Rosemarie Jäger from Germany and Galerie Rob Koudijs and Galerie RA from The Netherlands  and from the UK, Adrian Sassoon, Gallery SO, Contemporary Applied Arts, London Glassblowing, Ruthin Craft Centre and Joanna Bird, are just a few. Daniella Wells, Show Director, Collect 2014, says: It's such a privilege to work with the exhibitors at Collect, who bring expertise and exceptional work from well-known makers and new talent. Working on Collect for over a decade now, it's rewarding to see the fair develop year on year, and to welcome an ever increasing variety of work from around the world. I'm particularly looking forward to seeing new work and galleries from Asia this year, and I always come away from the event learning something new."